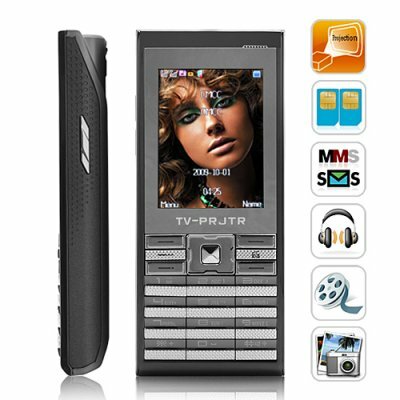 Successfully Added Titanium - Mini Projector Quadband Dual SIM TV Cellphone to your Shopping Cart. A state of the art mini projector PLUS a first class quad band dual SIM phone PLUS a multimedia powerhouse all in one amazing device - The Titanium Phone! Project Yourself! The Titanium is great for presentations without lugging around a 20 pounds projector and having to spend 30 minutes setting it up with sweat pouring down your face while the audience grows more and more impatient as each minute passes. Just transfer your media from your PC to your TF microSD card, insert the card into your Titanium phone and give amazing presentations everytime. Cast bright and vivid 30 inch wall presentations with ease! Amazing wall projection has never been this easy or affordable. Best of all, you get all this great technology in one sleek and lightweight phone! Have Phone Will Travel Lest you become so enamored with its projector functionality, we'd like to remind you that the Titanium is first and foremost a brilliant phone. Brilliant? Yes, an absolute genius phone that enables true quad band GSM reception! With a quad band phone, you're sure to be able to use your phone wherever in the world you travel. Oh and don't forget about The Titanium's dual SIM feature - you can put 2 SIM cards in one phone. One for business, one for your personal life...one for Angelina, one for Jennifer...whoever you choose, The Titanium is there to support you. Enjoy Life Slow down and smell the roses! Enjoy life. The Titanium Phone is your relaxation partner for those down times when you're waiting in the Business lounge for your connecting flight to Anchorage. It's got analog TV reception, radio, a still image and video camera, plus it also plays the most popular audio and video formats. Order your Titanium phone today and we'll ship it out tomorrow. That way in a few days your new and better life can truly begin. Brought to you by the leader in online wholesale direct from China electronics - Chinavasion. Yes, there is a button on the right side of the phone, press this button for 5 seconds and you will be able to switch modes instantly. Great phone for traveling ,top in it class.